where we have two brides, two grooms and three parents. Turns out double weddings make a very memorable and outstanding day cause it gives you more reasons to celebrate. And yes, we're having a major #throwback to the wedding of the sisters: Ayu and Dara. Ayu dan Dara took the next stage of their lives in an extraordinary way. The sisters held their wedding ceremony at the same day. This is the first time for us, Le' Motion, to be a part of something so unique and rare, our reaction to it was pure bliss and intense excitement! The Akad Nikah occurred in turns. The first one to do the Akad was Ayu and Lingga, then followed by Dara and Fano. The sisters chose different traditional theme from each other for this particular procession. 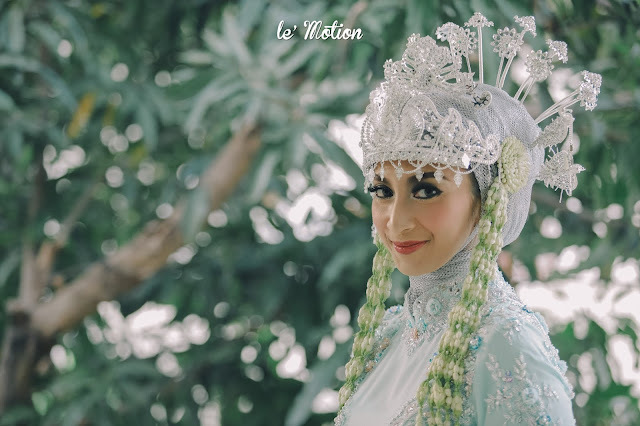 Ayu adapted Betawi customs while Dara on the other side adapted Bugis Makassar customs. Both Akad(s) went emotional yet jolly. The reception was held the next day. For this same-day ceremony, Minang traditional custom was the chosen theme. Wrapped in sapphire blue kebaya trimmed with beautiful silver sequins and paired with silver suntiang, Ayu and Dara successfully took all the attention of every single guests in the room. Another thing to adore is how Des Iskandar exclusively designed the Pelaminan for the two newlyweds to be a tiny replica of Rumah Gadang, Padang's traditional house. This was done in purpose of diverting the crowd and creating a private space for each couple to enjoy their momentous occasion. Decorated with great and pretentious details, dominated in Silver-ish color to match the wedding attires worn by the two couples, the Pelaminan successfully amazed everyone. Also, with a considerable amount of guests in mind, we were absolutely stunned by how Dnd did such an excellent job in organising the celebration and ensuring everything to be under control. Lastly, we would like to thank the family of these two stunning brides to let us take part in this unforgettable day. Ayu - Lingga and Dara - Fano. Congratulations on such a beautiful wedding! May love and happiness you have today forever grow.